Last week I got a sneak peek at the Perot Museum of Nature and Science in Dallas, which opens to the public on December 1st. Keeping to the “everything is bigger in Texas” mandate, the museum sits on nearly five acres and offers 180,000 square feet of exhibit space and places to play, and the result is something of a nerd’s paradise. On the prehistoric side, they've got several dinosaurs nonchalantly looming overhead, including an Alamosaurus (who sounds like he ought to be a Texan, but is in actuality New Mexican) that measures 85 feet tall, or in class trip parlance, is two school buses high by two school buses long. Many more exhibits dutifully document natural history as well as earth and space, but the biggest thrills for me were on the high-tech side – which makes sense, given that the museum is named for tech company magnate (and former U.S. presidential candidate) Ross Perot, whose children helped fund the museum in his honor. Three standouts that delighted me, as well as many kids on hand that day, were Earthquake Shake, a moving, rumbling piece of floor that you can “surf” at different earthquake magnitudes; the Musical Staircase, whose steps yield different notes, making it impossible to resist skipping up and down; and the coolest of all, a piece by artist Daniel Rozin called “Wooden Mirror” (pictured above), a curtain of wooden blocks that uses a microprocessor and camera to mimic the movements of whomever’s dancing in front of it. Fellow Shermans Travel blogger Darren Murph recently touched on the merits of visiting Dallas and taking in the Dallas Arboretum and the Sixth Floor Museum, and after seeing them for myself, I can second that both are worth your time, especially if you have kids in tow. Should you visit the arboretum before the end of the year, your family will still be able to catch the magnificent Chihuly glass sculptures, so colorful and plant-like that they add an almost eerie dimension to the already lush and vibrant foliage. If you’ve got younger kids in your brood, however, you may want to save your arboretum outing for spring of 2013, when the Children’s Adventure Garden is slated to open. I got a sneak peek of sorts at this, too: you can see parts of the garden under construction, and among the garden features I heard about was a maze whose difficulty level can be adjusted by removing panels – it’s always a good sign when an attraction is putting this much thought into the age appropriateness of its attractions. Teens and their parents who visit the former Texas Book Depository, home to the Sixth Floor Museum, will find a methodical but often enlightening audio tour that shepherds you through photography and video footage that celebrate the John F. Kennedy presidency with as much gusto and precision as it chronicles the before, during, and after of the assassination. Nothing about the exhibit is overly graphic. The sixth floor window perch from where Lee Harvey Oswald fired his rifle, with boxes stacked around it, is more clinical than sinister, especially since it’s partitioned off with a glass wall. The most lurid thing you and your kids might notice if you happen to be looking out at window are tourists, regularly trotting out into Dealey Plaza traffic to get their photos taken next to one of two white X’s painted in the road, each corresponding to the position of the presidential limo when Oswald’s first and second bullets struck President Kennedy. While this is indeed the Sixth Floor Museum, one of the hidden gems here is on the seventh floor, where you’ll find two large B&W portraits of President and Mrs. Kennedy. 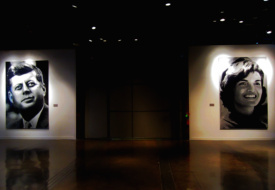 The two portraits are striking from afar, but grow more dramatic when you get up close and realize that JFK’s portrait is comprised of 50,000 tiny photos of his wife, and Jackie’s portrait is likewise made from 50,000 images of JFK. Given that 2013 marks the 50th anniversary of the Kennedy assassination, the museum is expected to mark the occasion with special exhibitions and programming – something to keep in mind should you visit Dallas next fall.